The property is connected to mains water and has been newly wired by a certified electrician, the electricity pole is next to the house and it can easily be connected. The house has aluminium framed double glazed windows. The house has been renovated in a rustic style, using high quality wood and retaining original features. The roof is new and it was all insulated with roof mate. On the right hand side of this room there are curved wooden stairs that lead up to the mezzanine where the bedroom can be created. The big beam and the roof construction is made of seasoned eucalyptus. The stairs and the floor beams are red cedar wood .The floor boards and the ceiling boards are Nordic pine. All the wood has been very well protected against any form of insects. The roof is well insulated with roof mate. 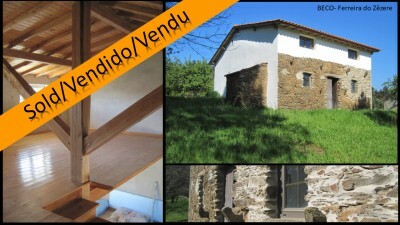 The property is set on a plot measuring 2.560 square meters and has good views into the countryside. To the side of the house there is a traditional bread oven which has it’s opening from inside the house. To the rear of the house there is plenty of space to create a wonderful terrace or covered patio facing the garden. On the land, there is a number of mature fruit and pine trees. The house is located in a very peaceful setting, has good access on a tarmac road and only two neighbouring houses without being overlooked. The next town to the property is Beco, which has a few cafés and a mini-market, and the pretty little medieval hamlet of Dornes with its river beaches is only six km away. The larger town of Ferreira do Zêzere, which has a range of shops, supermarkets, schools, butchers, restaurants, banks, bakers, bus station and library, is around 10 minutes drive.